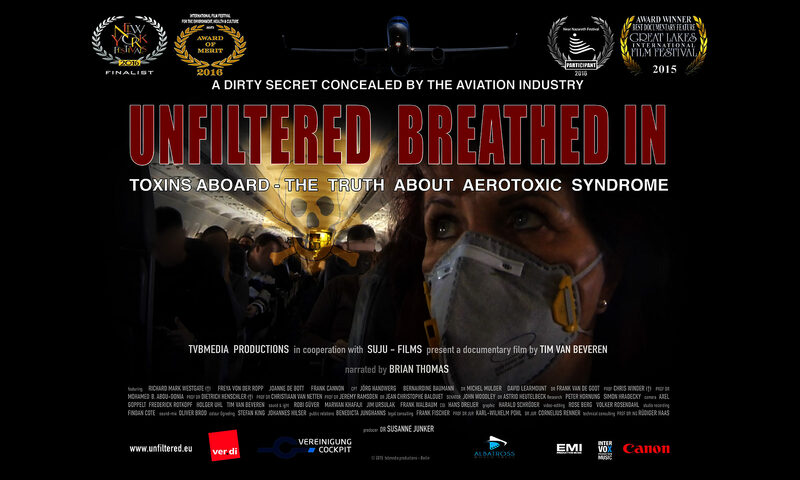 We are pleased and honored to announce that our documentary film „UNFILTERED BREATHED IN – The Truth about Aerotoxic Syndrom“ by Tim van Beveren was awarded as „Best Documentary Film” at the 2015 Great Lakes Film Festival, USA and also became “Finalist” at the 2016 New York Festivals, the world best TV & Films competition with entries from 50 countries around the globe. Furthermore it became “Officially Selected” for the 2016 Near Nazareth Festival in Israel and was awarded with an “Award of Merit” at the International Film Festival for the Environment, Health and Culture 2016 at Jakarta, Indonesia. The German language version of this originally in English language produced and released investigative documentary started on October 11th, 2015 at the Metropolis Movie Theater in Hamburg, Germany. TVBMEDIA PRODUCTIONS and SUJU-FILMS from Berlin, Germany produced the film completely independently from normal film funding. The festival versions are narrated by Deutsche Welle anchor Brian Thomas. The film deals with toxic (contaminated) cabin air on aircraft. Further screenings in Germany and abroad are planned for 2016 and 2017. The film was produced over the period of two and a half years. It could only be made because participants waived or referred salaries and payments. Worldwide distribution is with Albatross World Sales GmbH, Leipzig, Germany. Currently a French and a Chinese language version exist apart from the English and german original. A Spanish and a Serbo-Croatian language version are being prepared to be released soon. “Crew and passenger compartments air must be free from harmful or hazardous concentrations of gases or vapours.” EASA CS 25.831, FAA Part 25 Sec 831. The reason for this disparity is quite simple. The stricter test set by USA (which predates the bleed-air problem) was not adopted in Europe because the European industry and politicians lobbied against its adoption on the sole basis that the standard could never be met. Until the introduction of bleed-air systems for cabin air pressurisation in the late 50s, in a joint-venture of French aircraft manufacturer Sud-Aviation and Rolls-Royce, the so-called “ram air” system was widely used in civil aviation. Even the legendary Boeing 707 intercontinental jet was originally delivered with a ram-air system. Later, as an option, a bleed air system was made available. Almost 50 years later Boeing launched a new ram-air system design with its latest Boeing 787 “Dreamliner” fully electrical environmental control system. Suppliers such as Liebherr Aerospace have developed similar systems for use in future generations of electric aircraft, such as the Airbus A320neo. Flying is seen as safe, because the perceived accident rate is so low. But there is disturbing news. The only air you breathe in aircraft (except the Boeing 787 Dreamliner) comes through the hot compressor section of the aircraft’s jet engines or auxiliary power unit. In other words every breath that enters the lungs of all occupants has first come through the large fan at the front of the engine, been pressurised inside the engine casing, and superheated to temperatures higher than 400oCelsius, before being cooled and then delivered to the cabin for all to breathe. On its passage though the engine the air you breathe is contaminated by the superheated decomposition products of the lubricating engine oil, hydraulic fluid and de-ice fluid. The first two involve organophosphates and de-ice fluid involves ethylene or propylene glycol. All are toxic and are of major health concern. That is not the only contaminant. Jet engines are like giant vacuum cleaners, sucking up everything in their path. A proportion of anything and everything that is sucked into the fan ends up in the lungs of occupants. Even molecules of the metals used in the manufacture of the fan and the engine, have been found in the bodies of aircrew. Aircrew are reporting with symptoms associated with the known toxicity. Genetic variation (DNA) plays a major role in ability to detoxify. This film records the history of bleed-air, including the mistakes, the greed for profit at the expense of health, the official denials and the deliberate cover-ups but especially the failure of safety regulators to act, and the reluctance of politicians to face up to their responsibilities. 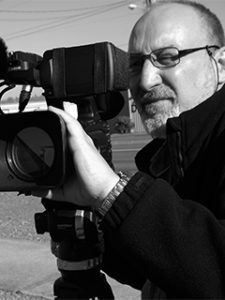 Tim van Beveren is a well-known and fearless investigative journalist, and has been following the issue since 2008. Having studied Law, Art and Journalism, Tim is both a qualified pilot and a very proficient and artistic cameraman. He has been reporting about safety-relevant topics in aviation for more that 20 years for international newspapers, magazines and German public and private broadcast stations. He was also one of the six experts called to give evidence at a hearing conducted in the German Parliament in September 2011. He currently lives in Berlin, Germany. For some years, a team of doctors, scientists and an aviation lawyer has been working to uncover the truth about the disease, Aerotoxic Syndrome (AeS). Tim followed the research within the team, and charted its steady progress. When Richard Westgate, a 43-year-old medically grounded British Airways pilot, at the peak of his career, died suddenly in the Netherlands in December 2012, the team, with the permission of Richard’s family, immediately carried out a very specialised autopsy. It had been Richard’s expressed wish that an investigation into his illness and death be recorded and documented by Tim van Beveren’s film team. Richard had arrived in Glasgow in March 2012 to consult with Frank Cannon, an aviation lawyer. “Richard was obviously very ill, and he was puzzled’” said Frank. Frank is a Scottish lawyer, but has investigated cases, and acted, in many other countries. At university he excelled at forensic medicine, and, fifty years later, has never forgotten what he learned. Frank is also a qualified pilot, and has flown air-ambulance missions all over Europe for more than 20 years. Frank’s curiosity regarding the “aircrew disease” was aroused. Memories of the disgraceful official denials and delays with regard to pneumoconiosis, asbestos mesothelioma, and smoking ran against the grain for Frank, who can spot an injustice from miles away. In England in 2011, Richard had been referred to no less than 15 consultants without diagnosis. Frank helped Richard for the following 9 months until Richard died. He then directed the research on Richard’s tissues and fluids, finally publishing the results in July 2014. Forensic pathologist, Frank van de Goot, carried out the specialised and unusual autopsy on Richard. “It was very unusual to be asked to excise femoral and sciatic nerves, and put them into specimen jars, but that’s what we did!” said Dr van de Goot. Dr van de Goot studied and qualified at Amsterdam and Frankfurt, and then spent 7 years as a pathologist at the National Forensic Institute in The Netherlands. A sought-after forensic pathologist, one of his specialities is the dating of wounds and non-traumatic lesions. Until he was asked to become involved in the examination of Richard Westgate his interest in aviation was limited to seat selection on a flight. Since Westgate he has been involved in the autopsies and histopathology of a total of 5 aircrew, who all died while still in service – average age 44 years. Frank is now called on by European crash investigators to be one of the forensic pathology team in air disasters, including the shooting down of Flight MH17 over Ukraine. 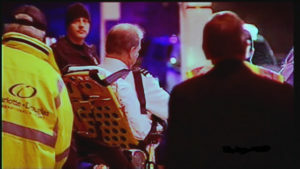 Also present at the autopsy was Dr Michel Mulder. Dr Mulder is a medical doctor, specialising in aviation medicine. Michel served in Africa with Medecins Sans Frontières. There he was instrumental in organising a Hercules airlift, and caught the flying bug. Later, after qualifying as a pilot, Michel became a KLM pilot ending up on long-haul routes. “Destinations in Africa” says Michel “were my favourite, for which I volunteered.” When pilots are able to bid for their preferred routes, most select Los Angeles, Boston, New York, Sidney, etc, but Michel would ask for Africa, using his stopovers to help organise village cleanwater schemes. At the same time he continued to practise as an aeromedical examiner on his days off. He has now seen hundreds of aerotoxic cases. In 2012 he diagnosed Richard Westgate as suffering the severest effects of Aerotoxic Syndrome. Histological examination showed that Richard was suffering from severe nervous system degeneration, including neuronal cell-death, as well as demyelination and axonal degeneration of the CNS and PNS. 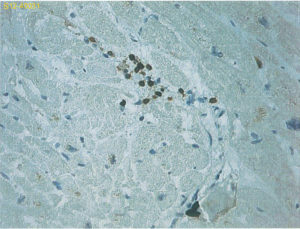 He also had inflammation of the peripheral nerves and, to the team’s astonishment, lymphocytic myocarditis. (1) That organophosphate compounds are present in aircraft cabin air. (2) That the occupants of aircraft cabins are exposed to organophosphate compounds with consequential damage to health. (3) That impairment to the health of those controlling aircraft may lead to the death of occupants. (4) That there is no real-time monitoring to detect such compounds in cabin air. A key scientific advisor to the team was Dr Jeremy J. Ramsden. He studied natural sciences — encompassing mathematics, physics, chemistry, biochemistry and cell biology — at the University of Cambridge (Fitzwilliam College), receiving his MA in 1981. He carried out his doctoral studies in chemical physics and nanotechnology at the Ecole Polytechnique Federale de Lausanne (EPFL), followed by postdoctoral studies at Princeton University. He has written or co-authored more than 250 peer-reviewed scientific papers and written a dozen books. (b) it reported air-sample levels of the dangerous organophosphate isomer tri-ortho-cresyl phosphate (ToCP), a constituent of the engine lubricating oil, at levels greater then the manufacturers claimed was in the oil in the first place. Professor Ramsden is now a professor at the University of Buckingham. Professor Dr Mohamed B. Abou-Donia is Professor of Pharmacology, as well as Neurophysiology and Cancer Biology at Duke University, North Carolina, USA. From an early stage in Richard’s investigation, Professor Abou-Donia was involved. He has extensive experience in the neurotoxicology of organophosphates including pesticides. He was the scientist who elucidated the Gulf Was Syndrome for the American armed forces. Professor Abou-Donia has authored over 350 scientific papers, lectured extensively and written so many books and chapetrs of books that his CV has still to catch up. Professor Abou-Donia points out that “there are five very important considerations that are overlooked when discussing cabin air contamination. 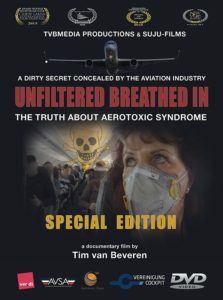 While some in the air transport industry still strongly deny the existence of “Aerotoxic Syndrome” van Beveren travelled once around the world during his research and production of this documentary to interview international scientists and other researchers and eyewitnesses. Dr Christiaan van Netten is a Professor in the Faculty of Medicine, School of Population and Public Health at the University of British Columbia. Dr van Netten’s research area is environmental toxicology with projects examining the use of electro-diagnostics to monitor worker exposure to agents that affect the peripheral nervous system. Professor van Netten has frequently found traces of the neurotoxin tri-cresyl-phosphate (TCP) in air samples taken on board various aircraft. He invented the only FAA approved air sampler, which was used in the air sampling for this production. David Learmount is a world-renowned and highly respected British journalist and aviation editor. He started his flying career in 1969, was working as cabin crew for BEA in Tridents and Comet 4C and was accepted into the RAF in 1970. He then trained on several military aircraft and ended up flying the Lockheed C-130 Hercules. He stopped his active flying career after he lost his medical certificate in 1976 and became a staff writer with Flight International in 1979. Although an independent aviation journalist, he is also the Consulting Editor for Flightglobal, publisher of Flight International, the foremost English language weekly journal for aerospace professionals. He regularly speaks at – and chairs conferences for – organisations like Eurocontrol, the Airports Council International, the Flight Safety Foundation, the International Society of Air Safety Investigators, the UK Royal Aeronautical Society and the UK Civil Aviation Authority, among others. Graeme Davidson is now a consultant aeronautical engineer. He lives in Scotland. Starting as an apprentice in Rolls-Royce at age 16, he is a fully qualified licensed aircraft engineer (Airframe & Engines). He has worked for all major airlines and on almost all aircraft. For a while he was the Cabin Air Quality Manager at British Aerospace (BAe). He spent almost his entire working life trying to clean up the contamination of aircraft cabin air. “In the end, its all down to money,” says Graeme. Captain Jörg Handwerg is a current board-member and was the former spokesperson of the German Pilot Union – Vereinigung Cockpit, (VC) from 2009 until 2015. He is a captain with Lufthansa currently flying the Airbus A320 family of aircraft. An airline pilot since 1989 he has also flown the Boeing 737 and 747 aircraft. In contrast to other unions, VC now takes a very critical position on the subject, and is voicing their concerns about health and safety implications for aircrew and passengers. VC also has as members several medical doctors who are also pilots and who are participating at EU and international level in numerous working groups dealing with the contamination of aircraft cabin air. Baroness Freya von der Ropp studied tourism at Cambridge University and became cabin crew with Condor German Airlines in 1999. She was injured during two fume events in a row, encountered on a flight originating at Hamburg, Germany and on the occasion of a later engine test run at Las Palmas Airport on the Canary Islands, on 22 March 2013. She and the purser of this flight are now permanently ill. The event was categorised as an “accident” by the Spanish Civil Aircraft Accident Commission and it is still under investigation. A final accident report is expected later this year. Joanne de Bott is an artist from Amsterdam who was a passenger on a Transavia flight HV6146 from Alicante to Amsterdam, which encountered a severe fume event on 31 January 2013. Ever since then she has suffered from a variety of cognitive symptoms, which she is convinced are associated with the event encountered aboard that flight. Angel Brain has been a British flight attendant serving with Bahrain based Gulf Air from 1993 until 1995. Then she became health-retired and her medical certificate was revoked by the airline. She returned to the UK and has been seeking help from several medical specialists since. In 2009 she became aware of the ongoing discussion about Aerotoxic Syndrome and found most of her symptoms match. She was diagnosed with a variety of persisting neurological symptoms that could not otherwise be explained. MP Markus Tressel is a German politician (Alliance ’90/The Greens). Tressel is a member of the German Parliament (Bundestag), to which he has belonged since the general election of 2009. Since 2004 he has been Secretary General of the Greens in Saarland and he works in the committee for tourism. For more than three years the Greens have pointed out the problems of contaminated cabin air on aircraft. Almost a dozen parliamentary initiatives submitted by Tressel underscore how much contradiction exists in German federal government opinion. He has pointed out in recent years that the problems are multiplying and he has criticized the BFU (German Agency for Flight Accidents). MP Thomas Lutze grew up in Leipzig. The politician studied design and manufacturing technology at the University of Saarland, and afterwards worked at the Regional Office of the parliamentary group in Saarbrucken. He has been a member of the German Bundestag since 2009, and works within the Committee for Tourism alongside Markus Tressel. Professor Chris Winder(† 2014) was born in Britain and has been a Professor in applied Toxicology and Occupational Health and Safety at the University of New South Wales (UNSW) in Sydney. He dedicated almost two decades of his life to the issue of contaminated air on board aircraft. As a toxicologist he cared about the issue deeply and had compassion and understanding for what chemical exposures can do to humans. Winder testified during the Australian Senate Inquiry in 1999, the same year he, Dr Jean Christophe Balouet and Dr Harry Hoffman (a former US Navy flight surgeon and medical examiner) coined the phrase Aerotoxic Syndrome and published amongst other peer reviewed papers: “Aerotoxic Syndrome: Adverse health effects following exposure to jet oil mist during commercial flights.” He died unexpectedly in May 2014 from an untreatable brain cancer. Dr Jean Christophe Balouet is an expert who specialises in environmental forensics, and contaminant release and control. He is managing director of Environment International, a company he established in 1993. He served for seven years in the United Nations Environment Program. He has been active in aerospace materials and chemicals, including their impact, toxicity and standards. He is frequently called as an expert witness, and is a consultant to OEM’s. He is a member of Air Transport Safety and Crew Health/Passenger Health Committees. Balouet is one of the three scientists who coined the words “Aerotoxic Syndrome”. Amongst other publications, his work includes many peer-reviewed publications on the topic of jet engine oil compounds, including TCP. Professor Dr Dietrich Henschler († 2014) is a German physician and toxicologist, who graduated and received his doctorate at the University of Würzburg, Germany in 1953 and 1957. From 1961 onward Dr Henschler was involved in, and from 1969-1992, was the chairman of the ‘senate-committee for reviewing of health hazardous workplace agents of the DFG’ (German Central Organization for the promotion of research at Universities and other publicly financed research institutions) This body determined the maximum workplace concentration limits (so-called ‘MAK’ limits) for chemicals. His work includes ‘structural-activity-relationships and mechanisms of action of the neurotoxic compound tricresylphosphate. His comment regarding TCP is as follows: “There is no sensible limit for this substance with which we could offer any assurance of no health damage.” Until today, in contrast to other countries, there is no limit value for TCP in Germany, which means that there is legally zero tolerance of TCP in breathing air at the work place. Professor Henschler died in 2014. Bearnairdine Baumann was born in Blackpool and is a former Lufthansa Purser and Checkpurser who flew for over 20 years, after which she was grounded and subsequently medically retired due to on-going ill health which she acquired through a multitude of toxic compounds in contaminated cabin air on aircraft. She is author of the book “The Air I Breatheit’s Classified” which was published in 2015, in which she tells her story. She is the founder of Aerotoxic Team, a network within which affected cabin crew, pilots and passengers can get professional help and support. Dr Astrid Heutelbeck is deputy medical director and physician at the Institute for Occupational, Social and Environmental Medicine at the Medical University of Göttingen, Germany. For three years she has been seeing and treating patients after fume events, as well as on behalf of the Employers Safety and Liability Insurance of German airlines, the BGVerkehr. The University and external laboratories were finding evidence of toxins in blood and urine samples of patients after fume events, which according to Dr Heutelbeck “do not belong there at all”, especially since some of the originating substances have been banned by the regulators many years ago for use in commercial products. Rev. John Woodley is a Christian Minister of religion and an Australian Democrats politician. From 1993 until 2001 he was a Senator representing the state of Queensland, Australia, in the Australian Senate and chairman of a Senate Inquiry into the air safety and cabin air quality of the BAe 146 from 1999 to 2000. He still remains unconvinced by the activities of aviation regulators and the aviation industry as a whole to properly recognise the importance of the problem. Brian Thomas was born in USA. He is currently news presenter at the English language world-wide program of Deutsche Welle Television. 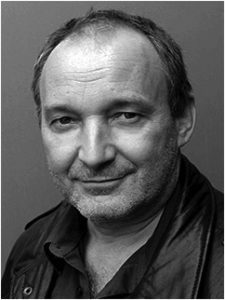 He provides the narrative voice for the film. You may watch the film in HD quality in the comfort of your home as video on demand. It is available for 24 hr rental or purchase via VIMEO. If you would like to purchase a DVD version (PAL) you may order it via our INTERNATIONAL WEBSTORE or AMAZON. The DVD contains additional bonus material at its rom-section. www.unfilteredbreathedin.com uses photos from Robi Guever, Tim van Beveren, happy landings productions as well as video from own production and materials used under fair quoting from other sources and the public domain.